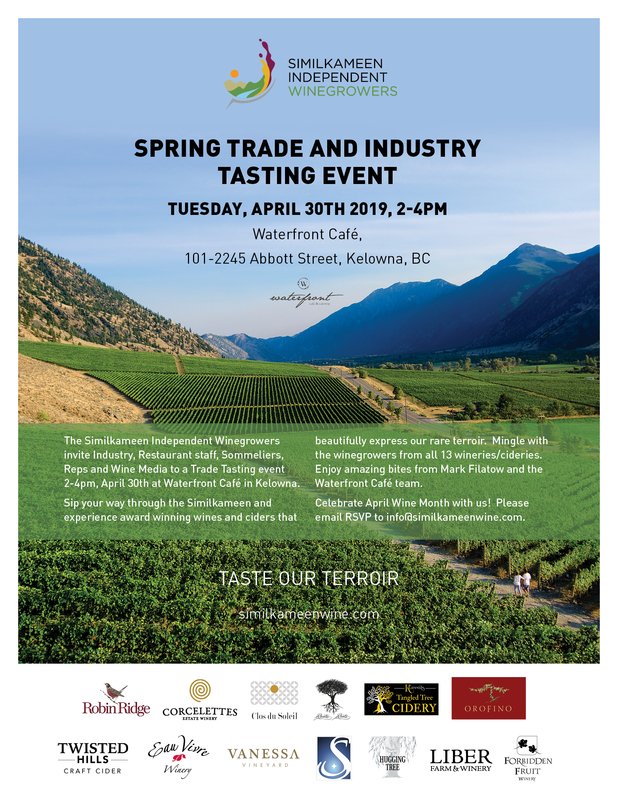 The Similkameen Independent Winegrowers invite Trade, Industry, Restaurants (Waitstaff, Chefs, SOMMs, Wine Directors, Owners), Wine Reps and Media to a casual, informative and fun tasting event, Tuesday April 30 from 2-4 pm at Waterfront Café in Kelowna. Mingle with Winegrowers from 13 wineries/cideries as you sip your way through the Similkameen. Experience award winning wines and ciders that beautifully express our rare terroir and enjoy amazing bites from Mark Filatow and the Waterfront Café team. Celebrate April Wine Month with us!